Forces inside and outside the earth can change the shape of earth’s surface. We have already seen the effects of geomorphic forces in our previous Geography notes. Endogenic forces and exogenic forces can create a lot of landforms. A landform is a natural feature of the solid surface of the Earth. Examples include Mountains, Plateaus, and Plains. In this post, ClearIAS brings you a brief overview of the major landforms of the earth, in a reader-friendly format, which helps in faster-learning. You will also be able to learn the economic significance of mountains, plateaus and plains. Aspirants who prepare for UPSC exams can surely expect many questions from this topic. Nearly 27% of the world’s land surface is covered by mountains. It is from the mountains that up to 80% of the planet’s fresh surface water come from. According to UN’s Food and Agriculture Organization (FAO), about 12% of the world’s population lives in the mountains, but over 50% are directly or indirectly dependent on mountain resources. 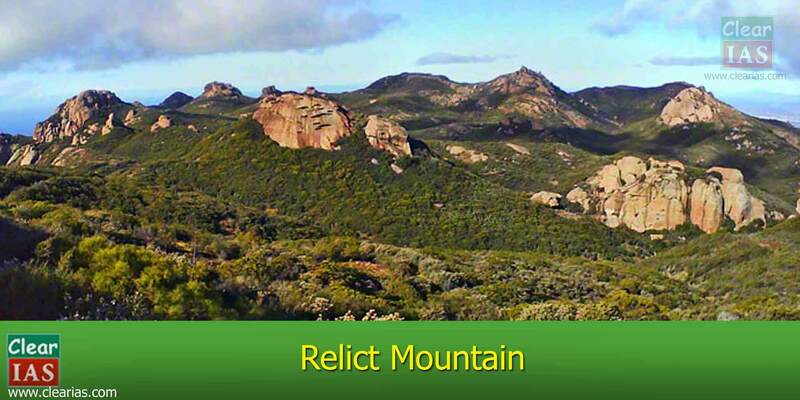 Mountain ranges mainly consisting of uplifted folded sedimentary rocks are called Fold Mountains. They are formed due to the force of compression arising from the endogenic or internal forces. 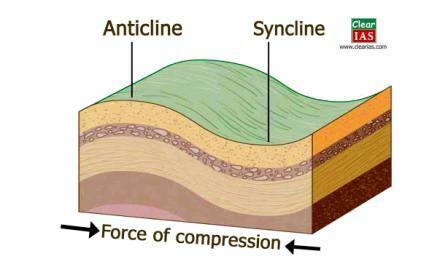 Synclines (trough) and anticlines (crest) are part of Fold Mountains. The Himalayas in Asia, the Alps in Europe, the Rockies in North America, and the Andes in South America are the most prominent fold mountains of the world. Since these mountain ranges were formed during the most recent mountain building period, they are also known as Young Fold Mountains. Block Mountains are also formed by the internal or endogenic earth movements which cause the force of tension and faulting. The down-lifting or uplifting of land in between two parallel faults results in the formation of Block Mountains. 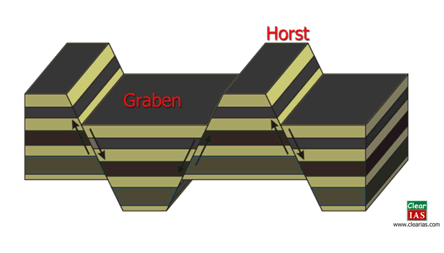 A block mountain is also called as Horst and the rift valley formed as a result of faulting is called as Graben. Examples: The Sierra Nevada in North America, Black Forest Mountains in Germany etc are typical examples of Block Mountains. The mountains formed by the accumulation of volcanic materials are called as Volcanic Mountains or Mountains of accumulation. 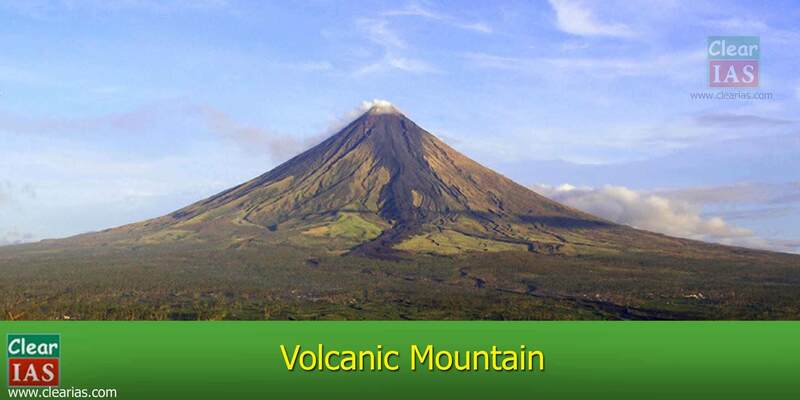 Examples: Mount Mauna Loa in Hawaii Island, Mount Popa in Myanmar, Fuji Yama in Japan etc are some examples. We have seen the effects of weathering (as part of exogenic processes). Weathering acts upon the earth’s crust constantly. To a large extent, the process of wearing down depends on the shape and structure of the rocks upon which it acts. So, in some cases, some portions of an elevated area escape from the process of weathering due to the hardness of the materials it is made of. These portions remain unweathered while its surrounding area gets eroded constantly. This results in the formation of Residual or Relict Mountains. Examples: Hills like Nilgiri, Palkonda, Parasnath and Rajmahal and Mountains like the Aravalli, the Vindhya, and the Satpura are some of the examples of Relict Mountains in India. Storehouse of resources: Mountains are the storehouse of natural resources. Large resources of minerals like petroleum, coal, limestone are found in mountains. The mountains are the main source of timber, lac, medical herbs, etc. Generation of hydro-electricity: Hydro-electricity is mainly generated from the waters of perennial rivers in the mountains. Abundant source of water: Perennial rivers arising in the snow fed or heavily rain-fed mountains are one of the important sources of water. They help in promoting the irrigation and provide water for many other purposes. Formation of fertile plains: The rivers that originate from the high mountain ranges bring silt along with water to the lower valleys. This helps in the formation of fertile plains and further the expansion of agriculture and related activities. Natural political frontiers: The mountains can also act as natural boundaries between two countries. They have a prominent role in protecting the country from external threats. Effects on climate: They serve as a climatic divide between two adjoining regions. The mountains cause orogenic rainfalls, diversion, and blocking of cold winds, etc. Tourist centers: The pleasant climate and beautiful sceneries of the mountains have led to their development as centers of tourist attraction. 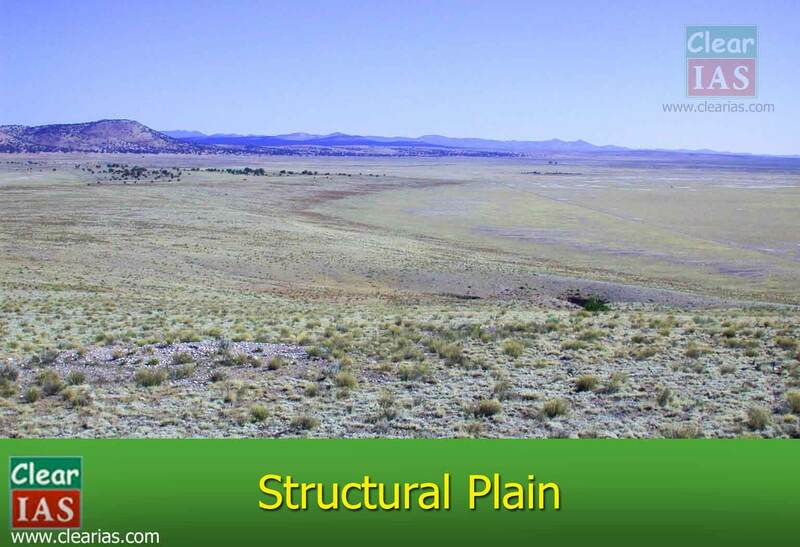 A plateau is an elevated area with a more or less leveled land on its top. It has a large area on its top and a steep slope on its sides. They are also called as high plains or table lands. The plateaus cover about 18% of the earth’s land surface. 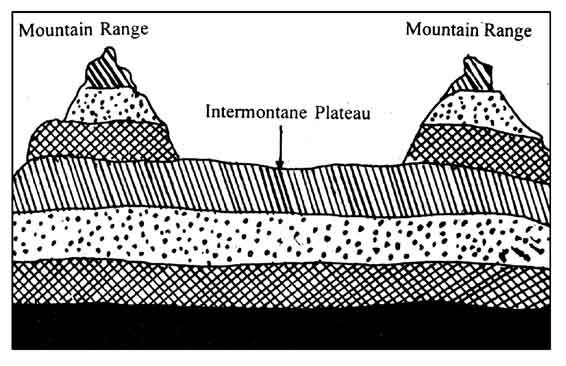 The plateaus which are bordering the mountain ranges (generally fold mountains) or are partly or fully enclosed within them are the intermontane plateaus. The word ‘intermontane’ means ‘between mountains’. Intermontane plateaus are the highest in the world. They have nearly horizontal rock layers which are raised to very heights by vertical movements of the earth. Examples: The Plateau of Tibet is an example of the intermontane plateau which is surrounded by the fold mountains like the Himalayas, the Karakoram, the Kunlun and the Tien Shah. 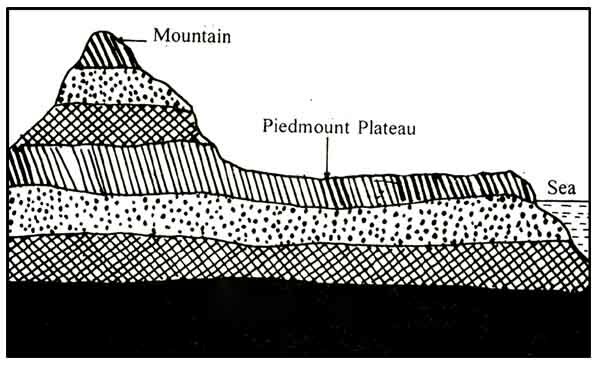 Plateaus which is situated at the foot of a mountain and is locked on the other side by a plain or a sea/ ocean is called as a piedmont plateau. The word ‘piedmont’ means ‘foot of a mountain’. They are also called as Plateaus of denudation as the areas once were high to the level of mountains, have now been reduced to the foot level of the mountain by various agents of erosion. Examples: The Malwa Plateau is an example of piedmont plateau. They are formed either by an extensive continental upliftment or by the spread of horizontal basic lava (less viscous) sheets completely covering the original topography. 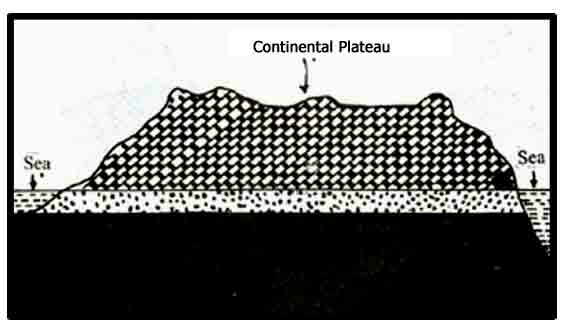 This kind of plateaus shows an abrupt elevation in contrast to the nearby lowland or sea (i.e. more steepness on sides). The Continental Plateaus are also known as Plateaus of Accumulation. Examples: Plateau of Maharashtra is an example of continental plateau. Lava plateaus are formed by highly fluid basaltic lava during numerous successive eruptions through numerous vents without violent explosions. Pyroclastic volcanic plateaus are produced by massive pyroclastic flows and they are underlain by pyroclastic rocks. 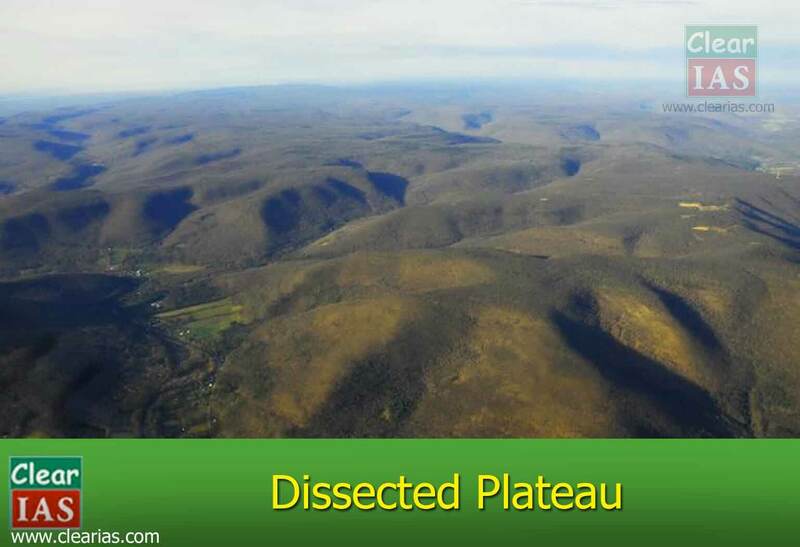 A dissected plateau is a plateau area that has been severely eroded so that the relief is sharp. Such an area may appear as mountainous. Dissected plateaus are distinguishable from orogenic mountain belts by the lack of folding, metamorphism, extensive faulting, or magmatic activity that accompanies orogeny (mountain building). 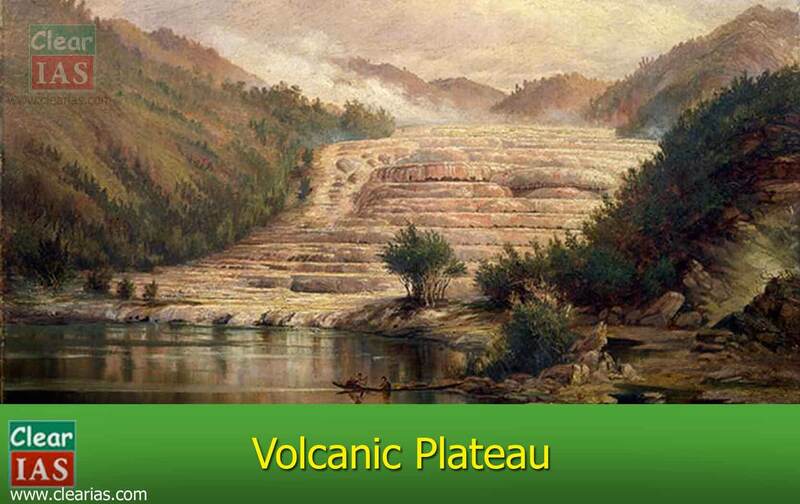 Storehouse of minerals: Most of the minerals in the world are found in plateaus. The extraction of minerals in plateaus is relatively easier on plateaus than mountains. The major portions of industrial raw materials are obtained from plateaus. We get gold from the plateau of Western Australia; copper, diamond and gold from the plateaus of Africa; and coal, iron, manganese and mica from the Chottanagpur Plateau in India. Generation of hydel-power: The edges of plateaus form waterfalls which provide ideal sites for generating hydel power. Cool climate: The higher parts of the plateaus even in tropical and sub-tropical regions have a cool climate. Animal rearing and agriculture: plateaus have large grassland areas suitable for animal rearing especially sheep, goat, and cattle. The lava plateaus when compared to other plateaus are richer in minerals and hence used for agriculture as the soil is very fertile. Plains are the most important landforms found on the earth surface. A plain is nothing but a low-lying relatively flat land surface with very gentle slope and minimum local relief. About 55% of the earth’s land surface is occupied by plains. Most of the plain have been formed by deposition of sediments brought down by rivers. Beside rivers, some plains have also been formed by the action of the wind, moving ice and tectonic activities (Refer exogenic processes). These plains are mainly formed by the upliftment of a part of the sea floor or continental shelf. They are located on the borders of almost all the major continents. The structural plains may also be formed by the subsidence of areas. 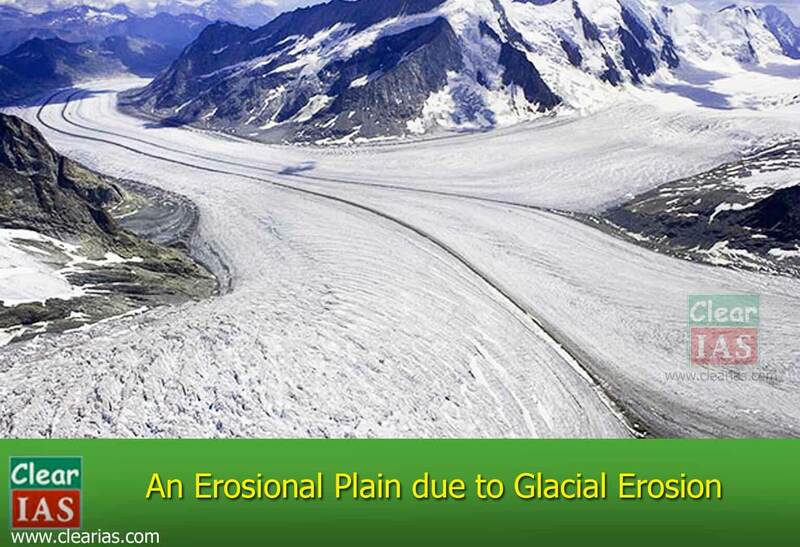 Erosional plains are formed by the continuous and long time erosion of uplands. The surface of such plains is hardly smooth and hence, they are also called as Peneplains, which means almost plain. These plains are formed by the depositional activity of various geomorphic agents. When plains are formed by the river deposits, they are called as riverine or alluvial plains. The depositions of sediments in a lake give rise to a Lacustrine Plain or Lake Plains. The Valley of Kashmir is an example of lacustrine plain. 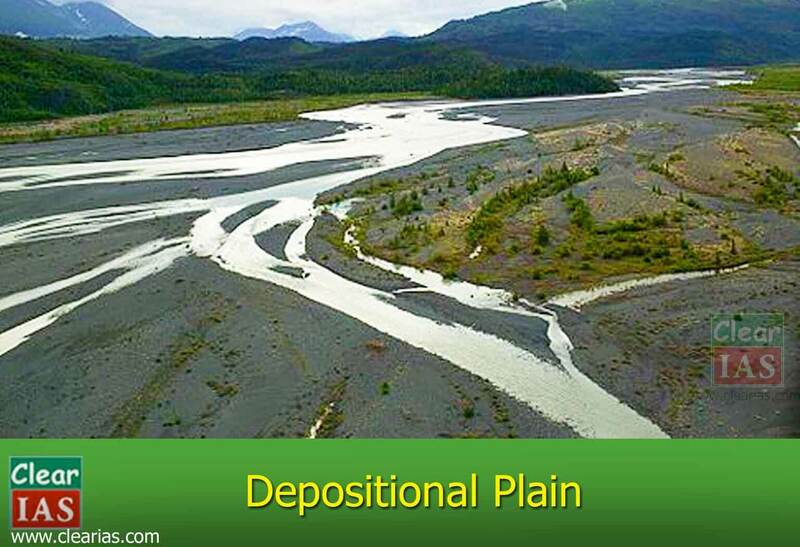 When plains are formed by glacial deposits, they are called as Glacial or Drift Plains. When the wind is the major agent of deposition, those plains are called as Loess Plains. Fertile soil: The plains generally have deep and fertile soil. As they have a flat surface, the means of irrigation can be easily developed. That is why plains are called as the ‘Food baskets of the world’. The growth of industries: The rich agricultural resources, especially of alluvial plains, have helped in the growth of agro-based industries. Since the plains are thickly populated, plenty of labour is available for the intense cultivation and for supplying the workforce for the industries. Expansion of means of transportation: The flat surface of plains favours the building of roads, airports and laying down railway lines. Centers of civilizations: Plains are centers of many civilizations. Setting up of cities and towns: Easy means of transportation on land and the growth of agriculture and industries in plains have resulted in the setting up and expansion of cities and towns. The most developed trade centers and ports of the world are found in the plains only and as much as 80% of the world’s population lives here. Mountains, Plateaus and Plains are some of the important landforms on earth. Each of these are classified into different subtypes are economically significant. PS: You can let our team know about any feedback or suggestions about these free study materials in the comment section below. Happy learning! your explanation is very good about the plain, plateau and mountain..thanks for all. it was a good experience very nice short and crisp information thanks alot. Excellent. Presented in a clear and crispy manner. I am pleased in having access to this web site because it helps me as a Geography instructor in preparing my lessons. thankyou for these free study materials. I can’t afford upsc classes due to lack of money. your post are easy to understand. keep posting, it will be a great help for me. Sir, I have a one question ganga born place ??? It is good and informative study materials. Sir please give some notes on rivers. 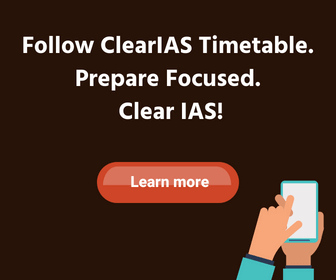 Hats off to Clear IAS.. Thanks for providing essential study stuffs freely. Why do equatorial zone have high elevated mountains are located in equatorial zone then all other portion of world? PROVIDE MORE ELABORATION. INFORMATION PROVIDED IS INSUFFICIENT. EXAMPLE. CONTINENTAL PLATEAU IS OLDEST OF ALL PLATEAU AND IT VERY EXTENSIVE AND OCCASIONALLY SURROUNDED BY MOUNTAINS ETC IS NOT MENTIONED. 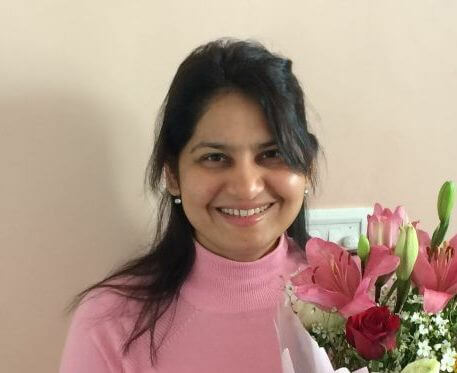 It’s really wonderful and I loved it very much but I want to clear a query which is – does it cover all the topics mandatory while writing upsc exam?